Jaguar Land Rover has been in some dire financial straits lately, but there’s no denying it does a few things very well, like sharp designs and that wonderful 550 horsepower supercharged 5.0-liter V8 engine. Now the Range Rover Velar gets this motor too, and all you have to do is put up with its name: Velar SVAutobiography Dynamic Edition. 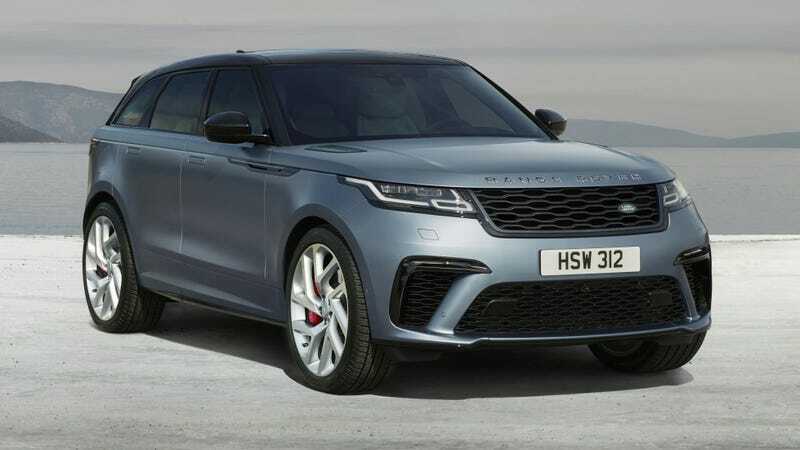 The first Velar with a V8, this bad boy looks like it’s gone to the gym to bulk up and demand we don’t count Land Rover out yet. It’s a beauty of a vehicle, destined to become the frontrunner of the Velar family. It’s going to be the fastest, most powerful, and most luxurious Velar to date. The word “dynamic” gives you a small hint to its bat-out-of-hell speeds: zero to 60 mph in 4.3 seconds. It has an electronically limited top speed of 170 mph. And that’s all while sitting in the lap of luxury. Land Rover highlights the Velar’s heated leather seats, its intuitive infotainment system, and its driver assistance programs as ways to enhance the ergonomic experience of the person behind the wheel. With an increase in acceleration comes an increase in stopping power. High-performance brakes provide all the controlled deceleration you’d need. It also packs continually variable dampers and firmer air springs. While the vehicle isn’t currently available for preorder, pricing will be released once the full 2020 model year Range Rover lineup is revealed. Correction 2/5/18, 1:39 a.m. EST: a previous version of this blog stated that this vehicle was available for preorder and quoted a certain price. That is incorrect, and we’ve changed that in the final paragraph. Parks And Recreation: "The Bubble"/"Lil&apos; Sebastian"